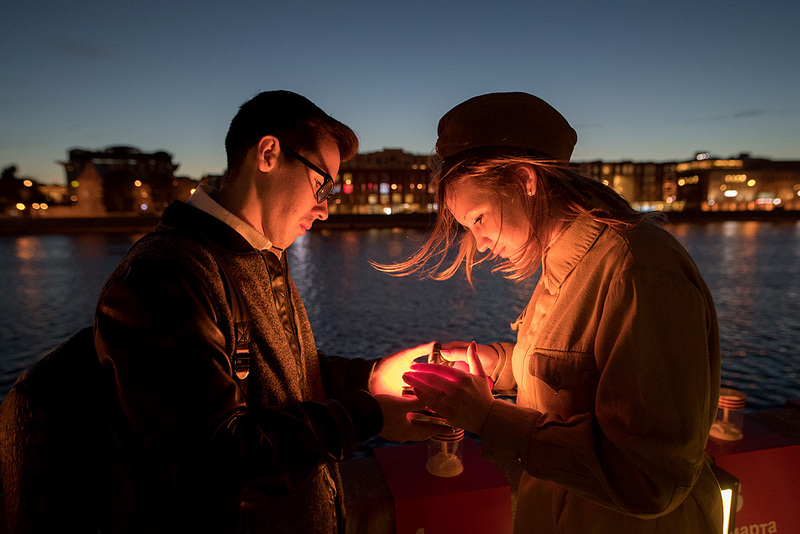 Participants in the Memory Line patriotic campaign light candles on the Krymskaya Embankment along the Moskva River to commemorate those who perished in the Great Patriotic War. On this day in 1941 Nazi forces invaded the Soviet Union, starting a-four-year-long war that became the most dreadful in Russia’s history. This tragic day, which still remains deeply etched in the collective consciousness of Russians, also left a deep imprint on Russian cinema. Nikita Khrushchev, after watching this iconic film, lashed out in anger and called its lead character a "whore." The tragic fate of Veronika, played by Tatyana Samoylova, however, became the symbol of the hardships Soviet women had to endure during the war and touched millions of hearts throughout the Soviet Union and beyond. TheCranes are Flying received the Palme d'Or in 1958. Arguably the best-known Soviet film about the beginning of the Great Patriotic War, TheCranes are Flying tells the story of two youths, Veronika and Boris, who fall in love just before the war breaks out. Despite his profound love for Veronika, Boris follows his call of duty and volunteers to fight on the front from where he never returns. But even when Boris goes missing, Veronika devotedly hopes to hear from him even though tragic circumstances push her into the arms of her lover’s cousin who has his own intentions. This historical war drama tells the true story of the June 1941 defense of Brest Fortress against invading Nazi forces. Events are narrated from the perspective of a 15-year-old boy, centering on three resistance zones holding out against the protracted German siege. The plot closely follows precise historical facts. Despite being vastly outnumbered, the fortress regiments hold out against German forces for almost a month. This historical drama is about the "Match of Death" between Soviet football players and German soldiers in occupied Kiev. The film depicts the day in June 22, 1941 when all Kiev residents were listening to Levitan’s voice: "Attention! Moscow is speaking! Citizens of the Soviet Union! We are transmitting an announcement from the Soviet government. Today at four o'clock in the morning, without presenting any claims to the Soviet Union, without declaring war, German forces invaded our country…"
After the war began, many football players from FC Dynamo tried to fight in the resistance, but were soon cut off from the partisans and the front. Rather than leave the occupied city, they decided to stay in Kiev and took jobs at the local bread factory, until German forces staged a series of "friendly matches" with the locals. This adaptation of Boris Vasilyev's novel of the same name, which tells the story of five young women serving in an anti-aircraft artillery unit during the Second World War, became the highest grossing film of the year in the Soviet Union. In the film, young female volunteers, who have just learned how to hold a weapon, find themselves up against a superior number of Nazi soldiers, but nevertheless show overwhelming courage in their clash with the enemy. This drama is set in 1940, a year before the war, when a wave of political repression sweeps through the Soviet Union – a time when even reading Sergei Esenin’s poetry was considered a traitorous act. A group of schoolchildren form notions of friendship, justice, and duty, which seem very ambiguous amid the background of NKVD purges and pervasive state ideology. The war begins only in the final scene of the film, after one character tries to comfort the acquitted but broken father of a student who committed suicide when pressed to renounce him as an enemy of the people. “The next year will certainly be a happy year, you will see,” says the girl, while soldiers begin their march to defend the country from foreign troops.